This entry is filed under How to..., Web Design. 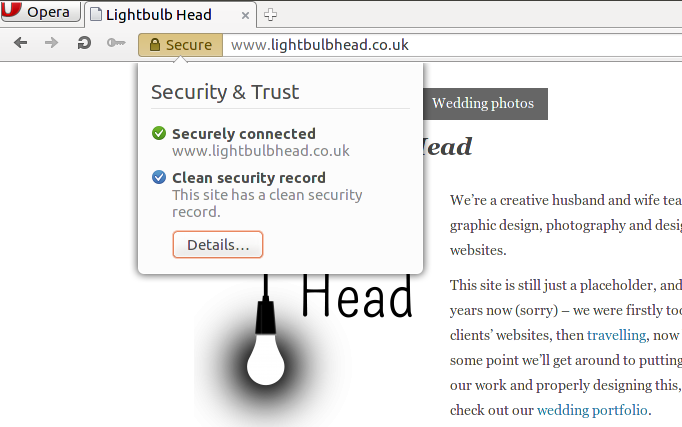 When you enter information into an online form, do you check for a padlock in your address bar? Would you have done the same 3 years ago? If there’s no padlock in your browser address bar, that means your data isn’t being transferred securely (in fact even if there is a padlock, it might still not be transferred securely… but that’s a different story). This means that anyone on the route between your computer and the machine hosting the website you’re sending data to could see said data. In the post-Snowden world that we live in, I think it’s fair to say that people in general are more aware of the information that they’re sharing online. But as a website visitor, you have very little choice as to whether your favourite website offers a secure version or not, which is why, I guess, Google have started to use the presence of a secure version of a website in their rankings – to encourage web developers to give their visitors a secure browsing experience. Obviously banks provide a secure version by default, as do most social networks and shopping sites, but small businesses may not and I think this is the group that Google are trying to appeal to with this move. Fix links within content. Now I really didn’t want to add another WordPress plugin to each site to create redirects, which is why I was happy when I came across some handy information at CSS-tricks.com (step 6), which I nabbed and implemented. I was unhappy I hadn’t come across it sooner in the process! All in all, about half an hour per site, once I’d done a bit of faffing around. Heading in a new direction?